Gatwick South Terminal is now a British Airways dedicated home with a number of lounges, both paying and courtesy for permitted corporate passengers. We pushed back on time and arrived on schedule. Block time was 1hr 30min aboard an Airbus A319. The security was fine but especially busy with mostly young leisure passengers. The £5 premium charge would have been worth it that morning, as I headed to the No 1 lounge – to check emails, as an AMEX regular. The Airbus single-aisle family is 3+3 with BA, but the legroom is not very generous, giving a cramped feeling. I am 5ft 4in and my knees almost touched the seat in front. Has an extra row of seats been added? Tell us more, BA! A toilet in the front and two at the rear were provided, but some aircraft are being fitted now with just a single restroom at the back. 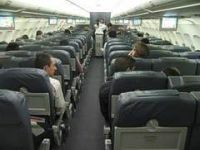 Our aircraft had a capacity of about 150 passengers and was 70% full. I always work on flights, but found I could not tilt the laptop top lid fully up on this sector. Luckily I had an aisle seat and two empty seats next to me. It was apparent most passengers had bought their on-board refreshments from one of the many eating outlets at Gatwick, stepping on board with brown bags. The A319 has dropdown screens from the overheads, an old moving map display, and, with this aircraft, not so large overhead bins. BA offers a selection of M&S snacks, sweets and sandwiches, but the take up on retail sales wasn’t so strong. I ordered a black coffee, bottle of wine and yoghurt apricot bar, total cost £5.60. The menu is regularly updated and now features a Christmas sandwich, presumably to entice more interest. 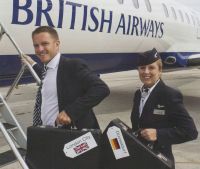 BA has pledged a wider inflight offering on short-haul. Cabin crew were friendly and the captain stepped out of the flight deck to say goodbye as we disembarked – on time. The flight attendants' faded pinstripe uniforms are looking very tired now, so the new Ozwald Boeteng design coming out to coincide with 100 years of flying on Britain’s airways will be welcomed by crew (see BA goes Boateng in this issue). Hopefully in 2019, BA, allegedly the nation’s favourite airline, will bring back free teas, coffees and water too, because this is what business travellers in short-haul Economy Class are united in feeling short-changed on. Edinburgh’s rebuilt terminal is pleasant to use with a speedy check-in and quick security. As more airlines come in, there is a notable array of more high-end shops, such as Michael Kors, but I was heading for the Aspire lounge and a breakfast after a late night at the ERA awards. British Airways Cityflyer is in fact a franchise airline with its own legal status, although owned by British Airways and wearing BA colours. In the Aspire lounge I spotted Susan Boyle tuck in to a sausage sandwich with an entourage of companions. She was heading to the Middle East. My flight back south to London City Airport was by Embraer 190 (E190) with a 2+2 layout – no middle seat – and a much more generous seat pitch (31in v 29in), a total of 98 seats and a single loo at the front plus one at the back. Small bins once again and not so generous as the Airbus A220 (nee C Series), which could well be on British Airways’ shopping list for London City Airport in the future. The 1hr 40min flight was 85% full. Shortly after take-off we were offered free alcoholic and non-alcoholic drinks (my neighbour ordered a Bloody Mary). A fascinating companion, she was headed to a two-day sleep conference. I asked if we could swap jobs. On this occasion we couldn’t be served hot drinks due to turbulence – high winds – but at that time of day courtesy popcorn, biscuits or crisps were offered. A friendly crew once again. We arrived 10min early and had to wait on the aircraft as the stand wasn’t ready for us, but once off within 5min I was on the DLR platform ready to take the 20min ride to Bank Underground. The outbound ticket cost £80 and the return £115, including two £5 seat allocations, and a free checked bag on both services, but do note prices vary from flight to flight and the time of day. www.britishairways.com/en-us/information/travel-classes But don't be fooled by the opening image. We think it is some kind of strange aircraft the art department dreamed up, a kind of wishful thinking.